One organisation can't satisfy the "needs and wants" of every single person; it's almost impossible and probably very expensive to attempt. This means firms have to divide the market into sections and choose the sections they would like to market their products at. Dividing the market into sections based on their characteristics and behaviours is known as segmentation. Firms commonly split the market based on demographics, income, geography, behaviour and psychographics. Demographics originates from the word ‘demography’ which means a ‘study of the population’. The population can be divided into age, gender, income, and family life cycle. As people age their needs and wants change, some organisations develop specific products aimed at particular age groups for example nappies for babies and toys for children. Gender segmentation is commonly used within the cosmetics, clothing and magazine industry. All Bar One within the UK have developed their bars to attract the female audience, taking opportunity of the rise in the number of women who now enjoy ‘social drinking’. In the UK we have also seen the introduction of Maxim, (www.maxim-magazine.co.uk) a male lifestyle magazine covering male fashion, films, cars, sports and technology. We have also seen the introduction of unisex cosmetic products like CK1 which works on the similarities between the two genders. Products and services are also aimed at different life cycle segments. Holiday companies cater specifically for families, single people aged between 18-30 and for adults going on holiday without children. Income segmentation is another strategy used by many organisations. Stores like Harrods, Harvey Nichols are predominantly aimed at the affluent market. Daewoo aim their vehicles at price sensitive buyers who require a bundle of benefits for the price. In today's globally competitive environment brands are specifically developed and positioned within particular income segments in order to maximise turnover. Geographical segmentation divides markets into different geographical areas. Marketers use geographic segmentation because consumers in different areas may display certain characteristics and behaviours in that particular region, for example, in London UK certain parts of the West End of London are more affluent then the East End and you will find particular products sold in these regions based on their affluence. An area can be divided by the town, the region or the country. If you are an organisation working on a global scale you may divide by global regions such as Europe, North America, South America, Asia and Africa. McDonalds globally, sell burgers aimed at local markets, for example, burgers are made from lamb in India rather then beef because of religious issues. In Mexico more chilli sauce is added than in other countries. Behavioural segmentation can be broken down into;Benefit, this is the benefit the consumer seeks from the product. How will the product enhance their overall lifestyle. When purchasing a computer the benefit sought may be ‘ease of use’ or the ‘need for speed’. Occasion, when should a product be purchased? For example the demand for turkeys increases during Christmas, flowers and chocolates on Valentine's Day. 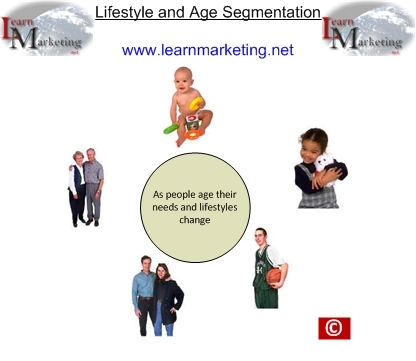 Occasion segmentation aims to increase the ‘reason to buy factor’ and thus increase sales. Usage rate divides customers into light, medium and heavy users. Heavy users obviously contribute more to turnover then light or medium users, the objective of an organisation should be to attract heavy users who will make a greater contribution to company sales.